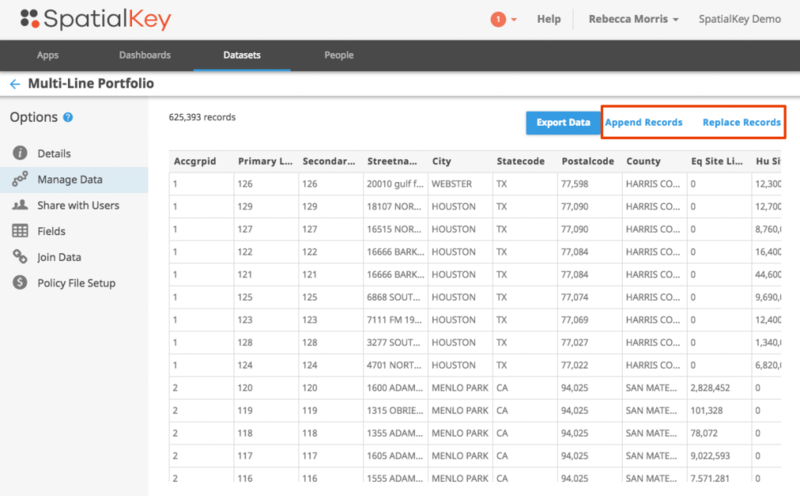 SpatialKey offers the flexibility to upload a new version of your dataset or append additional records to your dataset. Sure you could just import your new dataset again without using this feature, but you would have to reapply permissions, filters and joins, and recreate dashboards for the new dataset. Using the replace data or append data features will allow you to preserve any action that was taken on your dataset, saving you a lot of time! Upload a new version of your data or append additional records to your data from the Datasets tab. Click on the gear icon to view data settings and select the “Manage data” option on the left side of the screen. After selecting “Append more data” or “Replace all data”, the upload wizard will appear, helping you through the import process. That’s it. The upload wizard that appears will be even more simple than the original since all settings from the original upload of the file will be applied to the new dataset.